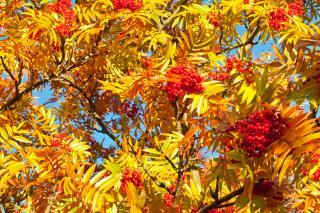 Mountain Ash or Rowan trees are a popular ornamental species derived from the genus Pyrus. 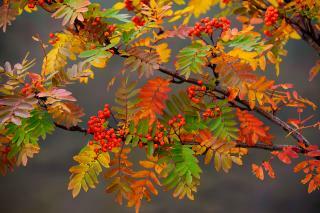 The trees are referred to by both names, though the Mountain Ash moniker is used primarily in North America, while Rowan is the preferred name in Europe. Regardless of what you call the garden tree, its appearance remains the same. 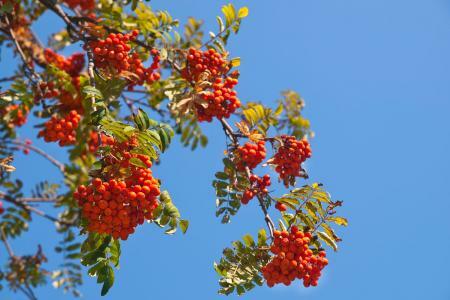 The Mountain Ash is an attractive specimen which bears pretty flowers and bright decorative fruit. The Mountain Ash is not part of the Ash tree family at all. It actually belongs to the same species as the rose bush, the Rosaceae. Most Mountain Ashes are shaped like shrubs, though some have a more traditional tree-like form and can grow to 50 feet tall. 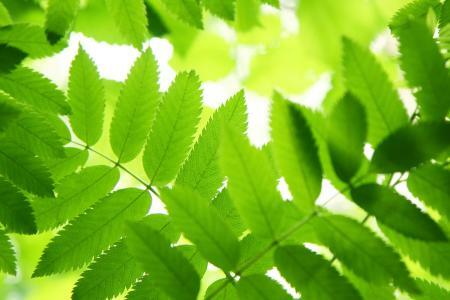 Leaves: Compound with up to 15 tiny leaflets. The pinnate are relatively long, measuring up to nine inches on some types. The leaves are dark green in the spring and summer but change to a spectacular mix of yellow, red and orange in the fall. Typically the leaves are paler on their underside. Bark: Light grayish bark with raised dots. The bark turns brown-gray as the tree matures. Flowers: Large clusters of small white flowers blossom in the spring. Each bloom yields five petals. Fruit: Bright orange-red berries form a cluster in late summer and can be harvested in the fall. Depending on the type of tree, the berries can range in color, including white, yellow, pink, peach, bright orange or red. The berries are edible, but are extremely acidic and do not have a pleasant taste. The small tree is a great addition to home landscapes and can survive more than 100 years if well cared for. 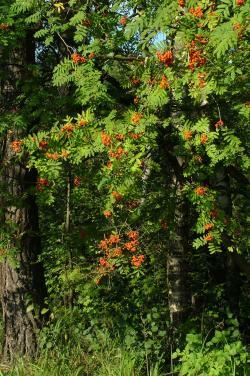 European Mountain Ash: This type of Mountain Ash bears more resemblance to a traditional tree. It is not as shrubby as the North American version, though it still bears the iconic bright fruit and delicate creamy white flowers. North American Mountain Ash: This version of the Mountain Ash grows to a more manageable height for the average homeowner looking to add the tree as a landscaping specimen. 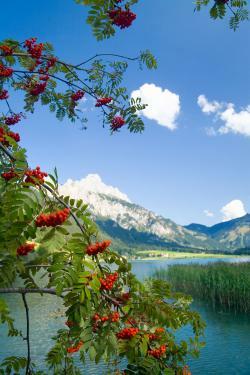 The North American Mountain Ash does not tolerate warm climates. The tree is known for its fiery red foliage in the fall and makes for a stunning addition to a suburban backyard. White Beam Mountain Ash: This Mountain Ash tree is commonly found in cooler climates. 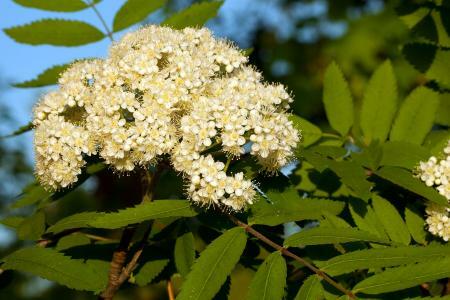 It differs from its cousins, the European and North American Mountain Ash trees, in that its leaves are not compound and the undersides are covered with white felt-like hairs. 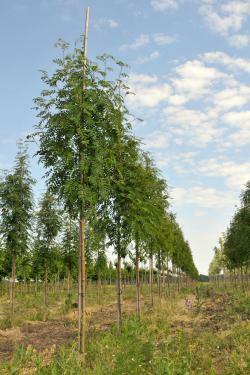 In North America, the tree prefers colder climates, moist soil, and full sun. It is especially prevalent in the Pacific Northwest where it is considered a top pick among landscapers who can cultivate the tree with much success given the region's temperate conditions. 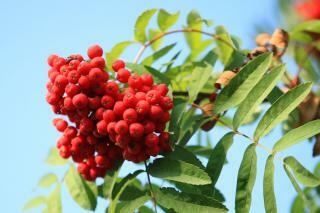 Food: Eating the Mountain Ash's berries raw is an unpleasant experience. However, when cooked, they are delicious in jams, pies, and wine. Drink: In Europe, the berries of the Rowan tree were, at one time, used to create a distilled spirit most similar to a beer. Medicine: Mountain Ash berries contain high levels of Vitamin C. Some cultures used to squeeze the juice from the berries, and drink it to prevent scurvy. Today, the berries are placed in tea and consumed to treat urinary tract infections and diarrhea. In some cases, the fruit juices are extracted and administered intravenously to treat glaucoma. Centuries ago, the bark from the tree was used as a blood cleanser. Wood: Timber from the Mountain Ash is quite durable and is used to make tool handles, walking sticks, furniture, planks, and beams. 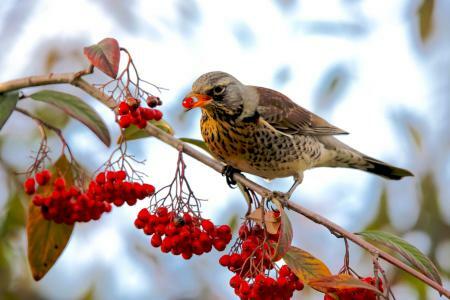 The Mountain Ash's large rounded canopy is also a popular home for birds that enjoy snacking on the tree's berries which grow in chunky clusters. 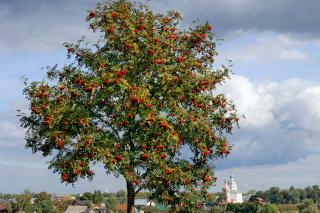 The Mountain Ash played a pivotal role in European mythology. 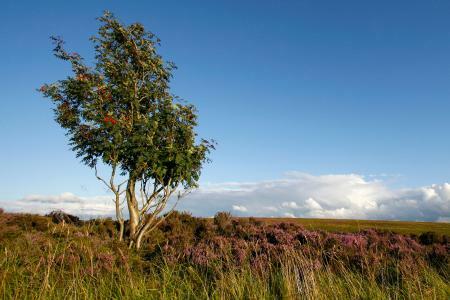 The tree was thought to have magical powers, including the ability to protect houses and ships from lightning strikes. 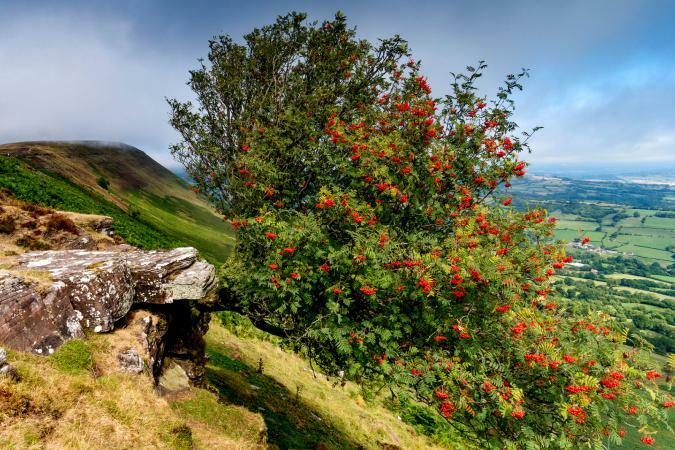 In some Celtic cultures, the Mountain Ash is referred to as the "Traveler's Tree" because it was thought to protect people from getting lost. In Ancient England, legend had it that Satan hung his mother from the branch of a Mountain Ash tree. Centuries ago magic wands were fashioned from Mountain Ash twigs. In parts of Europe, wood from the Mountain Ash tree would be erected near graves to keep the dead from haunting. In Newfoundland, residents would predict the weather based on how many berries were harvested in a season. A large crop would mean a hard winter was approaching. 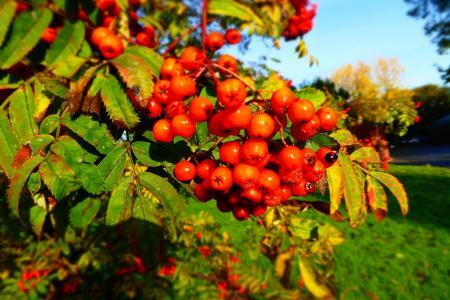 In Finland, some believed that if the Mountain Ash experienced an exceptional bloom, the rye harvest would be plentiful. Meanwhile, in Sweden, it was thought that if the Mountain Ash lost color prematurely, the fall and winter would bring illness. Healthy Mountain Ash trees are gorgeous specimens that can help brighten up even the most unattractive yards. However, the species is not immune to diseases that can rob it of its beauty and charm. Cytospora Canker: This fungal disease targets the tree's trunk and branches by peppering it with brown, irregular shaped cankers. The ugly pimple-like masses can ooze and spread throughout the Mountain Ash. In a severe case, the disease can kill the tree. Fire Blight: This infection kills the tree's flowers and leaves. Symptoms include black leaves, brown flower clusters, and spores that ooze slime and infect the tree's branches. Leaf Spot: This shows as irregular, brown spots on leaves. If left untreated, tiny, black spores will form as well. Advance cases also cause leaves to drop prematurely. Mountain Ash is also susceptible to sawflies which can defoliate the tree within a few days. Mountain Ash trees prefer full sun. Avoid planting the tree in the shade of a large building or near trees that tower over it. If the tree is robbed of sunlight, its flower and fruit production will be reduced. The tree grows better in slightly moist, acidic soil. Do not over water the Mountain Ash. Most Mountain Ash types do not need to be fertilized, though if your soil lacks nutrients you could add some fertilizer to the base of a young tree. Pruning is essential with Mountain Ash trees as it needs to be trained to maintain a single trunk. 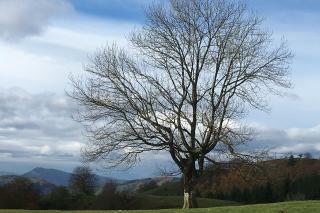 If regular maintenance is not done, the tree will become multi-stemmed over time. Mountain Ash doesn't fare well when exposed to pollution, road salt, and animals that like to gnaw on tree bark. As such, it's not a good idea to plant the tree along a busy street or in an urban environment with contaminated air. 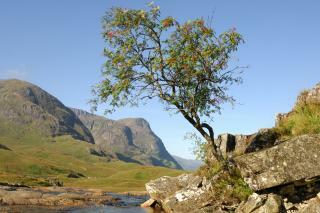 The Rowan tree is steeped in cultural mythology and practical uses, including medicinal, drink, food and ceremonial. Its shape, flowers and decorative fruit makes it a popular landscape choice.